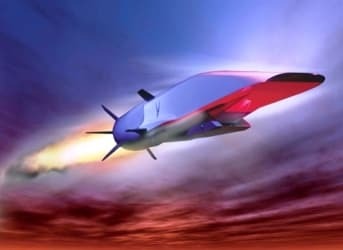 Yesterday the Air Force announced that its X-51 Scramjet Engine Demonstrator called the WaveRider — a hypersonic jet designed to travel up to 3,600 miles per hour — crashed into the Pacific Ocean 15 seconds into a test flight. This is the second failed test in a row for the WaveRider — an aircraft technology that the military has already spent between close to $300 million on developing. And that’s just on one program. We’ve been working on hypersonic flight programs since the 1960′s. But even with more than a quarter billion dollars worth of hardware now sitting in the Pacific Ocean (chump change for the Pentagon), we haven’t heard a peep from anyone in Washington on the crash. No calls for a Congressional investigation, no outrage about hundreds of millions of dollars sinking in 15 seconds, no public flogging of Defense Department leaders. But when a few cutting-edge clean energy companies crash after getting support from the federal government, they’re used by the House Republican majority as a tool to question the very idea of making strategic investments in cleantech. It’s been almost a year since Solyndra, the solar manufacturer that received a $527 million loan guarantee, went bankrupt. Since then, House lawmakers have held 10 hearings, acquired more than 300,000 documents, issued two subpoenas, and likely spent more than a million dollars on the investigation. “No evidence of wrongdoing,” reported Bloomberg Businessweek. This is not to say we should shrug off the bankruptcy of Solyndra and other clean energy companies. It’s Congress’ job to determine whether taxpayer dollars are being spent wisely — and taking a look into the causes and consequences of these types of incidents is important for transparency. But as we predicted when the Solyndra story first broke, these investigations have turned into a political sideshow. One year later, House lawmakers failed to prove their theory that decisions to offer loan guarantees to clean energy companies were based on political insider deals. Yet they continue to call for more documents and potentially more hearings, hoping to extend the Solyndra “crony capitalism” meme until after the election. Representative Jim Jordan (R-OH) was the most blunt about the House Republicans’ plan for Solyndra: Push the manufactured scandal until November and then drop it after the election. For all the talk over possible “smoking guns” that might show some wrongdoing on the part of the Obama administration on Solyndra or another Department of Energy loan, one House Republican acknowledged on Wednesday that multiple GOP probes on the subject are in some ways a play for votes on Election Day. That’s exactly how it’s playing out. The politically-manufactured outrage over Solyndra has turned into an all-out campaign — with tens of millions of dollars being spent this election season specifically targeting federal renewable energy investments. And here’s the really astonishing disconnect: While supporting tens of thousands of jobs, the loan guarantee program is expected to cost $2 billion less than Congress budgeted for, according to an analysis from Herb Allison, John McCain’s former National Finance Chairman. Meanwhile, amidst the Solyndra saga, we casually accept a $300 million aircraft failure without batting an eye. No outrage. No sustained political campaign. It’s just another day testing our military toys. Why? Because we don’t often see programs like this as a “failure” in the political arena. We would never use one failure as an excuse to abandon investment in new technologies. Most politicians accept losses in military R&D expenditures because the long-term gains are potentially so important for national defense and for eventually developing technologies for civilian use. We should always strive to make programs as efficient and cost-effective as possible. But a few bankrupt clean energy companies representing a fraction of the program’s budgeted cost is no excuse for abandoning federal investments in clean energy — a strategically important sector that is becoming one of the largest drivers of business this century. Alas, don’t expect anyone to publicly admit this. As the campaign season unfolds, political leaders are all too willing to practice the Solyndra standard. Stephen Lacey is deputy editor of Climate Progress. A version of this post first appeared on Climate Progress. What a defense of a failure, Mr Lacey, by noting an experimental test by the Department of War! You have numerous debacles in the Department of Energy, to compare to Solyndra, but then the left always likes to single out our military as wasted resources..
Once again, your .org agenda well noticed. Clean energy is a far more controversial subject for the political parties. It is more difficult to go against defense spending of any kind publicly. Hopefully, one day, both republicans and democrats will realize that saving the planet is beneficial to everyone.